Dionisio Ramón Emilio Valdés Amaro (October 9, 1918 – March 22, 2013), better known as Bebo Valdés, was a Cuban pianist, bandleader, composer and arranger. He was a central figure in the golden age of Cuban music, led two famous big bands, and was one of the "house" arrangers for the Tropicana Club. Bebo Valdés was born Dionisio Ramón Emilio Valdés Amaro on October 9, 1918, in Quivicán, Cuba. He started his career as a pianist in the nightclubs of Havana during the 1940s. He replaced René Hernández as pianist and arranger in Julio Cueva's band. In October 1946 the band recorded "Rareza del Siglo", one of Bebo's most famous mambos. From 1948 to 1957 he worked as pianist and arranger for the vedette Rita Montaner, who was the lead act in the Tropicana cabaret. His orchestra, Sabor de Cuba, and that of Armando Valdés, alternated at the Tropicana, backing singers such as Benny Moré and Pío Leyva. Valdés played a role in the adaptation of the mambo into the big band format (it was previously performed by charangas) during the late 1940s and 1950s, and developed a new rhythm to compete with Perez Prado's mambo, called the batanga. Valdés was also an important figure in the incipient Afro-Cuban jazz scene in Havana, taking part in sessions commissioned by American producer Norman Granz during 1952. These sessions yielded the famous improvised piece "Con Poco Coco" among others, which served as a precedent to Panart's descarga sessions (with one exception). In the late 1950s he recorded with Nat "King" Cole. In 1960, accompanied by Sabor de Cuba's lead vocalist Rolando Laserie, Bebo defected from Cuba to Mexico. He then lived briefly in the United States before touring Europe, and eventually settled in Stockholm, where he lived until 2007. In Sweden he was instrumental in spreading the techniques of Cuban music and Latin jazz. Valdés' career got a late career boost in 1994 when he teamed up with saxophone player Paquito D'Rivera to release a CD called Bebo Rides Again. In 2000, the film Calle 54 by Fernando Trueba brought his piano playing to a wide audience. In 2003, he and Diego El Cigala, a famous Spanish cantaor (flamenco singer), recorded the album Lágrimas Negras (Black Tears), a fusion of Cuban rhythms and flamenco vocals. During his career, Valdés—one of the founders of Latin jazz, and a pioneer in bringing Afro-Cuban sacred rhythms to popular dance music—won seven Grammy Awards: two for El Arte del Sabor (2002), one for Lágrimas Negras, and two for Bebo de Cuba in 2006 (in the categories "Best Traditional Tropical Album" and "Best Latin Jazz Album"). His last musical production was one fittingly recorded with his son: 2008’s Bebo y Chucho Valdés: Juntos para Siempre (Together Forever), winner of the Grammy Award for Best Latin Jazz Album at the 52nd Grammy Awards in 2010; they also won the Latin Grammy Award on the same field. In 2004, he was again filmed by Trueba, in El milagro de Candeal, in Brazil, and later composed a new score for Trueba's 2010 film Chico and Rita, whose plot included bits from his own life. Chico and Rita ends with the dedication "a Bebo". Valdés was first married to Pilar Valdés. 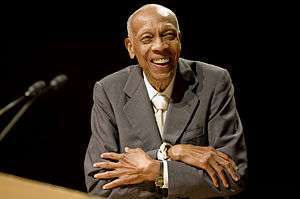 This marriage produced five children, one of whom is the pianist Chucho Valdés. In 1963 he stopped in Sweden on a tour with the Lecuona Cuban Boys. There he met the 18-year-old Rose Marie Pehrson (August 28, 1928), a cavalry officer's daughter. They got married the same year and he settled in Sweden. He described it as the most important moment of his life: "It was like being hit by lightning," he said. "If you meet a woman and you want to change your life you have to choose between love and art." They remained together until her death in 2012. Valdés was in the middle of the treatment of Alzheimer's disease, which he had suffered for several years, when he died in Stockholm, Sweden, on March 22, 2013, aged 94. 1 2 (Spanish) "Yo quiero tocar hasta que me muera" El País. Retrieved 4 June 2013. ↑ Díaz Ayala, Cristóbal (Fall 2013). "Orquesta Bebo Valdés" (PDF). Encyclopedic Discography of Cuban Music 1925-1960. Florida International University Libraries. Retrieved October 4, 2015. ↑ Giro, Radamés, 2007. Diccionario enciclopédico de la música en Cuba. La Habana. vol. 4, pp. 232 et seq. ↑ Leymarie, Isabelle (2003). Jazz latino (in Spanish). Robinbook. pp. 69–70. ↑ Delannoy, Luc (2005). "Apuntes de identidad: Identidades nómadas". Carambola: Vidas en el jazz latino (in Spanish). Mexico City, Mexico: Fondo de Cultura Económica. ↑ Fordham, John (25 March 2013). "Bebo Valdés obituary". The Guardian. Retrieved 30 March 2013. ↑ "Bebo Valdes — Charts & Awards — Grammy Awards". Allmusic. Rovi Corporation. Retrieved 2013-03-27. ↑ "Mejor Album de Jazz Latino". Univision (in Spanish). Univision Communications, Inc. Retrieved 2013-03-27. ↑ See the Pressbook (pdf) from the film's website. ↑ "Bebo Valdés, a Force in World of Cuban Music, Dies at 94" The New York Times. Retrieved 4 June 2013. ↑ "Fallece a los 94 años el músico cubano Bebo Valdés". 20minutos.es. Retrieved 2013-03-22. Wikimedia Commons has media related to Bebo Valdés.